Planning the assessment or blueprinting it. You basically are working out what it is that the test covers. Authoring or creating the items. Assembling the assessment or harvesting the items and assemble them for use in a test. Piloting and reviewing the assessment prior to using it for production use. 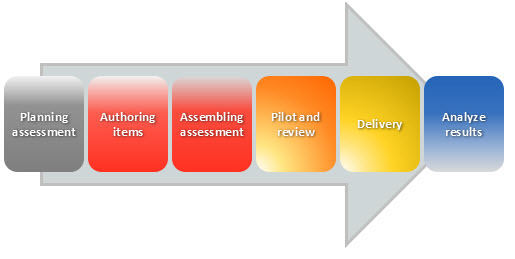 Delivering the assessment or making the assessment available to participants; following security, proctoring and other requirements set out in the planning stage. Analyzing the results of the assessment or looking at the results and sharing them with stakeholders. This step also involves using the data to weed out any problem items or other issues that might be uncovered. Each step contributes to the next, and useful analysis of the results is only possible if every previous stage has been done effectively. In future posts, I will go into each step in detail and highlight aspects you should be considering at each stage of the process. The processes organizations use to build assessments can have a big impact on the quality of the assessments themselves. Tom Metzler, Knowledge Assessment Administrator at TIBCO Software, Inc., explored this point during the Questionmark 2013 Users Conference, and we’re happy to share handouts from his presentation on Achieving a Better Assessment-Development Process. Tom spoke from experience! TIBCO’s certification team uses well-established software architecture methods principles to continually improve the efficiency of its assessment development process. Tom told how the team’s systematic approach helps save time and provides better information for subject matter experts. He explained how better processes result in better assessments, discussed the value of reusable components, and shared architectural models that you can be adapted for use by other organizations. This is just one example of what people learn about at our Users Conferences. Registration is already open for the 2014 Users Conference March 4 – 7 in San Antonio, Texas. Plan to be there!